You can learn a lot from a single ingredient, even about yourself, said Michael Twitty in The Cooking Gene: A Journey Through African American Culinary History in the Old South (Amistad). When I was first given a jar of sorghum molasses by my grandfather shortly after I started studying the foodways of my African-American forebears, “I didn’t even know what the slightly metallic, earthy-tasting stuff was.” I didn’t know that for my ancestors in the Carolina upcountry, “making ’lasses” was a fall tradition that once brought together whites and freed slaves to mill the tall sorghum cane, strain it, then boil it to a thick golden brown. And I definitely didn’t know that sorghum was an African grass cultivated on that continent for millennia before it arrived in America and spread quickly in regions just north of the warmer sugarcane belt. I keep an unopened jar of sorghum molasses on my desk to remind me of its importance. But I’ve learned to cook with it too. The traditional recipe below uses a brine to infuse chicken with the molasses’ sweetness. Tie the bird up in cabbage leaves, and throw in some of my kitchen pepper— a Caribbean-inspired blend of spices I use instead of plain black pepper. You can cook the chicken in an oven as described, but I also like to cook it in a cast-iron pot over an open fire. Heat stock and add salt and molasses; stir to dissolve. Transfer to a container large enough to hold brine and chicken. Add 5 cups cold water and let cool completely. Remove chicken giblets. Wash and thoroughly clean the bird, then submerge in brine, cover, and refrigerate 2 to 4 hours. Preheat oven to 350. Remove chicken from brine and rinse, then pat dry with paper towels. Mix 2 tbsp kitchen pepper with butter, lard, or canola oil. Rub chicken all over with this mixture, under and on the outside of the skin. Lay crossed lengths of twine and a layer of washed cabbage leaves in a Dutch oven. 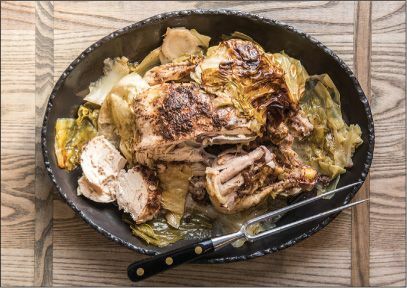 Set chicken on top; cover completely with more cabbage and tie into a loose bundle. Add a little water or chicken stock to pot, cover tightly, and place in oven. Roast 70 to 90 minutes. Chicken is done when wings pull away from twine, cabbage is browned on top, and the juices run clear. Serve with or without cabbage. Strain pan juices for passing. Serves 4 to 6. For kitchen pepper: Mix together 1 tsp each of coarsely ground black pepper, red pepper flakes, ground white pepper, ground mace, ground Ceylon cinnamon, ground nutmeg, ground allspice, and ground ginger. Makes ½ cup.